If you're in need of these or any other patio services, get in touch with us today. 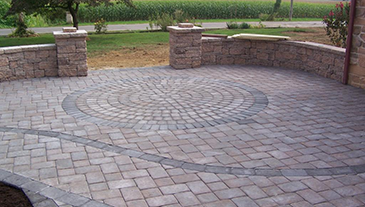 As your patio contractor, we will always provide you with comprehensive installation services. That means that you won't have to deal with an incomplete or improperly performed installation. We'll get the job done in a timely manner, while paying close attention to your needs. Our company offers free estimates to help determine whether a given project is right for you. Get in touch with us to schedule a free estimate today. Patios are among the most popular home additions. A new patio construction offers a variety of immediate benefits. First, a patio is excellent for entertaining your guests. Nothing beats dining or relaxing outdoors, enjoying the beauty of nature. Second, having a new patio installed will increase the value of your property. Homebuyers are sure to be interested in having a patio to enjoy on pleasant days. Finally, a patio is simply a great place to relax. Imagine getting home from a long day's work or play and sitting out on your patio, under the sun or stars. No matter what your reasons for adding a patio to your home, our pros are here to install it for you. Our company builds stone, concrete, and brick patios. Each type offers distinct advantages. Brick is affordable and is available in a variety of styles. Stone patios are classically attractive and tend to be smoother than brick. Both are extremely durable. Concrete patios offer their own set of advantages. As a building material, concrete is extremely versatile, making it easy to create a unique look for your patio. It's also easy to maintain when compared to brick and concrete. No matter what option you end up deciding on, we will always provide you with efficient and effective installation services. Contact us when you need a patio installed. We serve our customers in Jacksonville, Ponte Vedra Beach, Jacksonville Beach, Atlantic Beach, and Neptune Beach, FL.